We are a leading PVC Cling Film Supplier. The PVC Cling Film is manufactured from polyvinyl chloride and is available in various thicknesses, widths, and specifications. The PVC Cling Film possesses various unique features like Hygienic, Vapour Proof, and Anti-static etc. Avail the PVC Cling Film from us at competitive market prices. Packaging Details Carton As Your Request. NOVAPACK is a brainchild of ‘RAJ PLASTIC INDUSTRIES’ and ‘FLOWTECH INSTRUMENTS’ to foray into packaging business. With the vast experience of over 20 years in plastic manufacturing business and high demand of the quality product in Indian market company decided to get into manufacturing of PVC Cling Film divulging it under the brand name: NOVAWRAP. 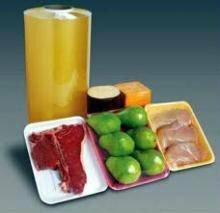 PVC Cling Film is manufactured from Poly Vinyl Chloride and is available in two grades i.e. Food Grade and Industrial Grade. Food grade is used for wrapping vegetables, fruits, meat, biscuits, etc. to keep it fresh and healthy. It has literally revolutionised preservation in food industry. It helps in keeping food fresh, attractive looking, preserving moisture and aroma of food and allows quick visual identification. It is hygienic, vapour proof and anti-static. Industrial grade is used for water proofing of material, parcels, cartons, etc. Gilt-edged approach towards the industry amidst cut throat competition makes us the leading manufacturer and suppliers of PVC Cling Film in the market.